An examination of the place of religion, especially Islam, in political and cultural life took on a special urgency after the events of 9/11. The essays in this volume concentrate on the way that Islam impacts on the everyday lives of people who reside in societies where Islam plays a large part. 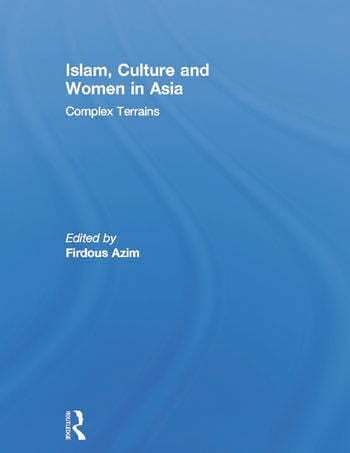 The relationship between Islam and women has always been seen as problematic, and by highlighting women’s negotiations with this religion, this volume seeks to understand the many and various strategies and connections that are made, and their political and cultural ramifications. By keeping an Asian focus, the authors also seek to understand the wide panorama that Islamic societies inhabit, and the manifold political and cultural expressions that ensue from this. The effort is not only to break the image of a monolithic structure and set of beliefs, but also to highlight on-the-ground negotiations, and the ways that women in particular find spaces within Islamic structures and discourses. This book was originally published as a special issue of Inter-Asia Cultural Studies. Firdous Azim is Professor of English and Chairperson of the Department of English and Humanities at BRAC University in Bangladesh. She is a member of Naripokkho, a woman’s activist organization based in Bangladesh. She is a member of the editorial collective of IACS. Her research interests and writings include post-colonial and feminist literary analysis and issues pertaining to feminist activism. She is the author of The Colonial Rise of the Novel (1993).